Air Baltic Buys Another 30 CS300s of Bombardier. The Latvian airline Air Baltic has signed up for 30 more Bombardier CSeries aircraft and taken options on another 30 of the type. The airline says it has signed a firm purchase agreement for 30 CS300 and options for 30 more. Deliveries of the new aircraft will begin in the fourth quarter of 2019. 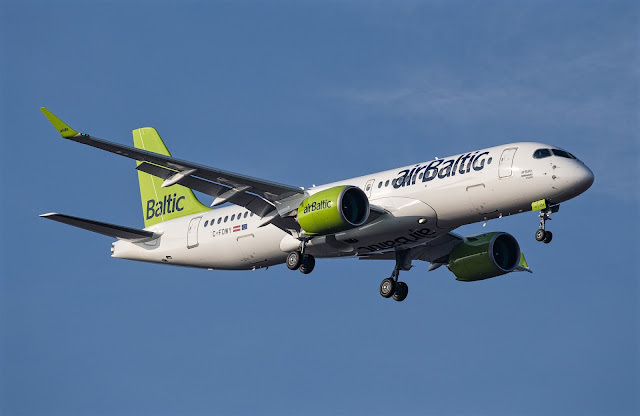 Air Baltic has already ordered 20 of the type, eight of which are in commercial service. "In 2017, we experienced exceptional growth and showed the world the unique capabilities and comfort of this innovative aircraft," says Air Baltic CEO Martin Gauss. "We have successfully implemented our fleet modernization strategy, and we look forward to further growing our fleet of up to 80 CS300 aircraft while phasing out our other types of aircraft over the next three years." The airline has said previously that it was looking for more CSeries aircraft as replacements for its Bombardier Q400s, of which it operates a dozen, and its Boeing 737-300 and 500s. The new aircraft will support the next stage of its business strategy, which points to a significant expansion of routes in the main Baltic markets of Latvia, Estonia and Lithuania. "A fundamental part of this new strategy is the introduction of a larger and more exclusive fleet of the entire CS300 aircraft, which is the most suitable aircraft for the markets in which we operate," says Gauss.